And Fallows himself—probably as famous in news journalism circles as Gehry is in architectural ones—seems fascinated by all the energy sparked by this question about how to create great public places. Whatever else comes out of this lively discussion, I think it shows that discussions about how we create congenial public places where people can come together is a major issue of our times. Public space is not just an aesthetic detail, or minor sideshow for the design community. It’s central to the fabric of lives and future of our society. Which is why it’s no surprise that opinions on the subject are so strong. 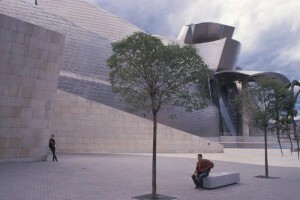 The public space on the waterfront of Bilbao in front of Gehry's building is a site of frequent muggings as a result of the limited reasons for people to be there.